The One Yoga Class I Couldn’t Miss. There was silence on both sides but I could still hear my heart beating and see my hands tremble on the steering wheel. I pulled off to the side of the road to catch my breath. I wasn’t surprised by her death, rather, I was ready for it. 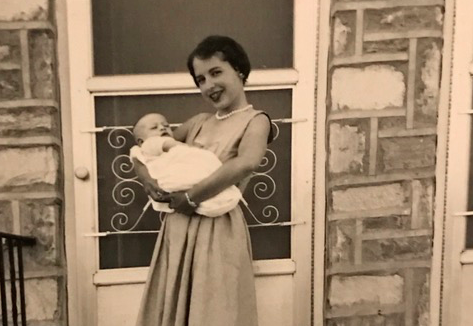 My mother had dementia and was quickly going downhill—losing weight, her memory and the will to live. She kept telling me that she wanted to go home, that’s where she belonged, but she was not able to care for herself and a nursing home facility was the best place for her. She didn’t like that. She was stubborn. If she couldn’t go home she didn’t want to be anywhere. She grew hopeless, refused to talk to me on the phone and stopped eating. When I received the phone call from the social worker that day, I was 3,000 miles away. I needed some time to get organized before I flew back home. First on the list was getting to my 9 a.m. yoga class. If ever I needed to practice yoga and feel the support of a group of people, it was today. I wasn’t going to miss it. Yoga for me is a place to breathe and to deal with problems in a way that transcends words. I felt like parts of my mother were scattered inside of me, like a puzzle that had fallen to the ground . The pieces seemed to stick like they were glued together inside me. I needed to become mindful. I needed to unglue the sticky parts of myself. My mother’s last breath would be with me all day—especially during yoga. I breathed in all the good memories and breathed out all the bad. I inhaled the times when I felt that she loved me and exhaled the instances where I felt neglected. Yoga is a safe place where we can work through our pain with the help of your breath and the movement of our body. We can open up an uncomfortable story and create a narrative with better perspective and more gratitude. So as I moved into each yoga pose that morning, I thought of my mother and what it felt like to lose her. Sure, I had concerns about how to go about wrapping up her life, taking care of funeral arrangements and settling her estate, but here in the yoga room it was about what my needs were in that moment. I set an intention that day to honor my mother’s memory. A soothing instrumental of the Beatles’ song, “Blackbird,” played in the background. My mother was in the room with me; her soul rested by my side and together we stretched out our mats on the clean hardwood floor. I silently told my mother to keep breathing, to try to have a peaceful transition from this world to the next as she floated around in limbo. I could sense her loneliness; I could smell her despair. She never got what she wanted out of life. Her dreams never materialized, nor did she know how to pursue them. She became a housewife at an early age, not believing that she had any other opportunities. As I drifted from first to second warrior, I could see myself glide back and forth in the mirror—smoothly transitioning to side angle and on to reverse warrior. It was a slow moving meditation on our lives together. We traveled through the past, recounting many of our memories like a rickety old home movie. In reverse triangle, I thought about the things that I could have done differently, perhaps reached out, called or visited her more often—and most of all, been more patient. I looked to the sky, lifted up my heart and asked for forgiveness for the things I’d done and wrung myself out in revolved triangle, washing myself clean. As I moved into humble warrior, I thanked her for helping me grow, for tolerating my immature and annoying behaviors. I didn’t always follow her directions, but she kept trying to teach me nonetheless. Part of my past is over. My mother is gone. There are new people in my life that I have to acknowledge and love. Yoga has given me the strength and flexibility to make adjustments on the mat and to make changes in my life off the mat. I saw my mother in the mirror moving with me. One by one all the things that kept us apart seemed to disappear. Together we transitioned from one phase of our lives to the next. The tears, disappointments and traumas didn’t seem to matter anymore. They were just transient, impermanent events that evaporated into the atmosphere. I took in a big breath and let go. I lay down in savasana, remembering all the beautiful things, all her good qualities and actions. I felt her essence surround me like the essential oil that the yoga teacher sprayed in the room. I felt only love for my mother as we held hands in the final pose. I felt what it was like to be no longer living, to be in a space where you feel nothing. Mark Tulin is a retired Family Therapist from Philadelphia who now lives in Santa Barbara, California with his wife, Alice. He spends most days writing poetry, short stories and doing yoga on a standup paddle-board in the Pacific Ocean. 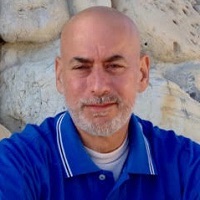 He has published in the Santa Barbara Independent, Family Therapy Magazine, Smokebox.net, Five, Fiction on the Web, eFiction, Page and Spine, Creative Writing Outloud and others. He has an upcoming chapbook called, Magical Yogis. You can learn more about Mark on his website.